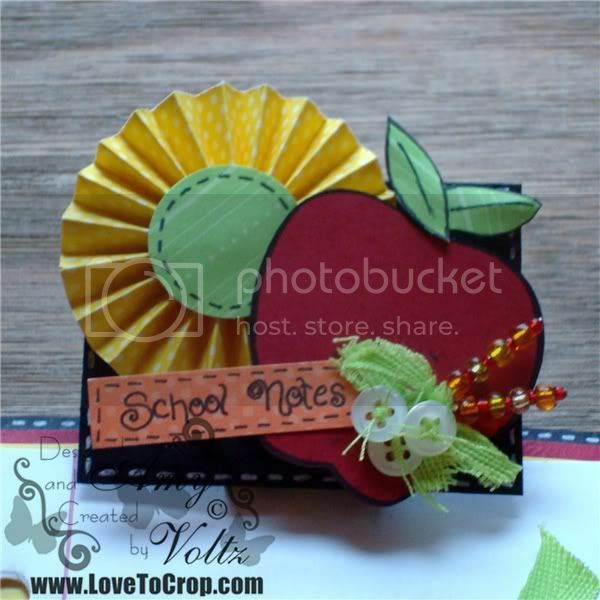 Welcome to the Back To School Blog Hop!! We're so happy you could join us for this super-fun hop showcasing cards, layouts and projects for Back To School!! You'll find an array of ideas throughout the hop -- From teacher gifts to lunchbox notes, we hope you'll enjoy each and every project along the way!! Class is just about to start, so let's get hopping!! If you've hopped over from Barbara, then you are in the right place!! If you've just popped in to visit my blog or are reading this via email and you'd like to join our School-Time FUN, then please CLICK HERE to start at the beginning with Lynda's blog because... The beginning is always the BEST place to start!! :) Several stops along the way will be offering some nifty prizes, so please be sure to keep an eye out for that!! 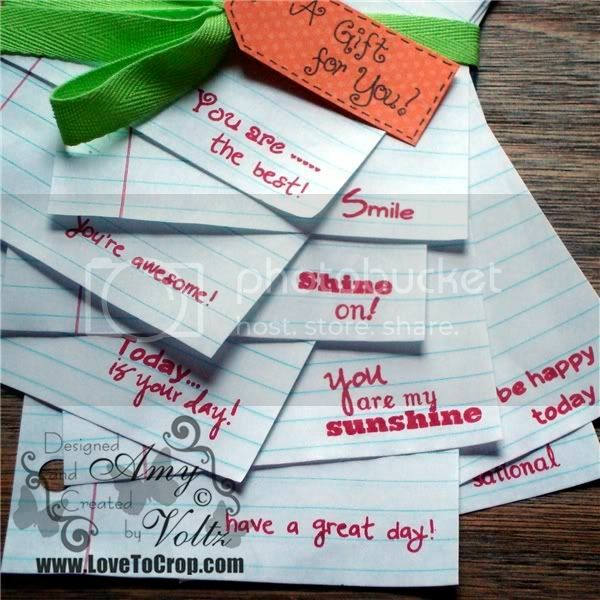 For the hop today, I've created a cute and FUN mini clipboard sized just right for school-time notes and messages!! The final project measures about 4.75" wide and 7" tall. I started with a sturdy piece of chipboard measuring 4.5"x6.75" and covered it with BLACK cardstock (4.75"x7") on both sides. I then adhered a 4.5"x6.75" piece of RED cardstock and a 4.25"x6.5" piece of YELLOW decorative paper to the front. The notebook paper is trimmed down to measure 4"x6.25". To make the topper, I started with a 1.75"x2.5" piece of sturdy chipboard and covered it with a 2"x2.75" piece of BLACK cardstock on both sides. I added a rosette (1"x12" strip of YELLOW decorative paper scored at 1/4" increments, mountain-valley folded down entire length, ends adhered together to create loop, then pressed flat and squeezed in the center -- adhered to circle using strong liquid glue OR glue gun), an apple (cut at 2.25" with the Creative Memories Cheerful Seasons Cricut Cartridge), two handmade stick pins, a touch of frayed fabric ribbon, 3 buttons, and a handwritten "School Notes" tab. I tied a bow around the clipboard and added a tag (with a hand-written sentiment - "A Gift for You!") after stamping each notebook page with a sentiment from the "Positive Thoughts", "Splashtastic Summer", and "Fashionable Friends" Stamp Art Sets from K Andrew Designs. To create the 'clip' at the top, I repurposed a medium-sized binder clip -- I simply added my topper to the front of the clip with two strong glue dots. I used both my white Signo pen and my black Creative Memories fine-tip pen to add some faux stitching to my project as a finishing touch... Below you'll see a selection of the different K Andrew Designs stamps I used on each page. Please become a follower of my blog and leave me a comment answering this FUN question: "What is your favorite Back To School memory (school shopping, seeing a favorite teacher, time spent with friends)?"!! Thank you again for checking out my project... Now hop on over to Lori's blog and remember to visit all the stops for more chances to WIN!! This is a great project, and it turned out wonerful. It was always fun going back to school to see all my friends. Thank you for sharing! I am your newest follower on GFC! I hope you get a chance to stop by my blog at www.artsandcraftsado.blogspot.com. This is so cute. I love how you created it all from scratch. The pages are fabulous. I love how you stamped on each page. Great job as always. My favorite school memory was the first day of school, reconnecting with friends that were gone during summer vacation and meeting new people who moved into the district. Thanks for the memory reminder. LOVE this project, and how you made each page special with the stamps! This would be a great back to school gift for a teacher. Amy! One of my favorite people!! I gave each step of the project my 'rapt' attention to learn exactly how to make it because it is just perfect for my BFF. Then I see you are giving it as candy! PLEASE tell "random" to pick me!!! tee hee! Love this. Such a cute gift. Definitely making some of these for my teacher friends. Oh my Amy, this is so cute. What a great gift idea. I am already a Happy Amy follower. Wonderful idea. I really will use it. My favorite memory was when I was 12 years and I just met the most wonderful teacher. She's super. You stamped every page?! It's a super cute gift already but the fact that you did that took it to another level of thoughtfulness. Hmmm, what's that I hear? Oh it's those happy little animated birds swirling around & singing again. PS I still have not been able to post my Super Mom card. I will try again! Thanks love your blog! Back to school meant seeing friends again and my birthday just around the corner!! My favorite memory of school was my 4th and 6th grade teacher. He had a fun way of teaching. For our multiplication tables we would sit on top of our desks and throw a rubber ball around the room saying them outloud. He did that with learning to count in Spanish also. He would even come out and play games with us at recess. It was a great way of getting kids that normally wouldn't do anything to get in on the fun. He was a great teacher. I was lucky to have him. 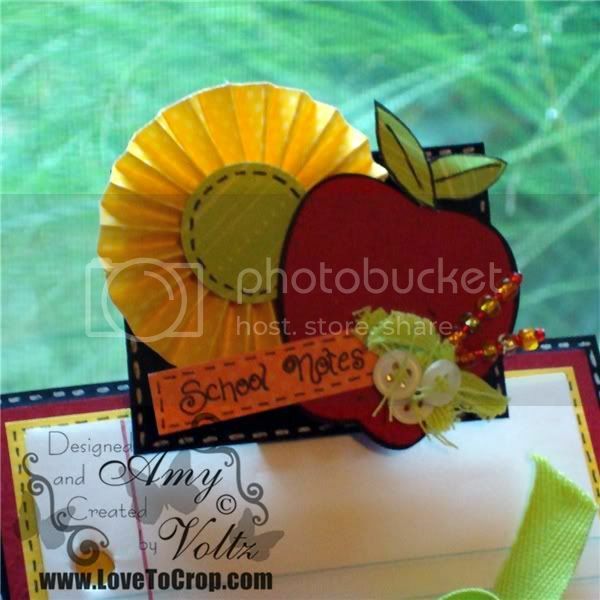 what a cute idea for the mini clipboard thank for sharing and for the chance to win. just simply stunning. looking at it i had no idea you made the clipboard itself. love everything about this project. who wouldn't want to write there notes on this. my favorite school memory is when we all use to incorporate singing into everything we did. we sang during spelling, social studies, gym and so forth. That mini clipboard is so cute! I love it! My favorite back to school memory is walking in to 3rd grade and discovering that my favorite reading teacher from 2nd grade was my 3rd grade teacher! What a wonderful year that was! Super cute notebook! My favorite basck to school memory was going to the school about a week before and seeing who my teacher was going to be and if any of my friends were in my class. TFS. Too cute, Amy! What a great teacher gift this would be. My favorite thing about back to school time -- school supplies! Yep, I was a paper, pencil and marker junkie way back when, too! My favorite back to school memory is helping my favorite teacher set up her classroom for the new year. I had ms. spector for 5th grade and helped her for 3 yrs after that! Hello! 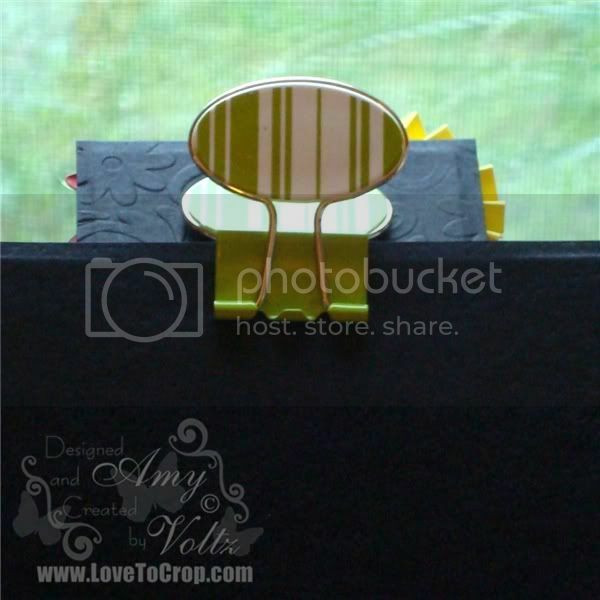 I am your newest follower from the blog hop and am loving (and wanting) the clip board. I never knew that back to school could be so fun. I remember not being able to sleep the night before. Nerves I guess, but when I got into high school I think I was just excited. I really liked school. Thanks for sharing! Stop by www.micheggy.blogspot.com sometime and check out our crafty blog if you like. We love to have people visit and hopefully follow. Thanks for sharing! My favorite back to school memory would be shopping for new school clothes and supplies (I love the smell of new pencils and paper!). Holy Cow!!! This is so wonderful!!! My favorite back to school memeory is definitely school shopping! I remember bugging my mom for weeks to go. I loved trying on all the clothes and shoes. It was always so fun to hang with my family and go to lunch while we were out! Fun times. Now I am a teacher and I love the time right before school starts, going in and unpacking and setting up my classroom, getting the room ready for a new class. I am a follower of your great blog and my favorite thing is the SHOPPING. I always got great new clothes before school started and the time spent shopping with mom was priceless. Super fun clipboard! My favorite school memory was getting new clothes and shoes to start the year off ! Love your clipboard!!! The details are just beautiful! My favorite school memory is wearing my brand new clothes the first day and meeting my teacher (I was always a teacher's pet)! My favorite back to school memory was always paper and freshly sharpened pencils! It never gets old. Very cute clip board. my fav part of going back to schoolwas going shopping for new clothes. This clipboard idea is great. Done without a traditional clipboard it is truly original. I have never seen one before and this one is adorable. The stamps on each page is a nice bonus. Thanks for the idea and inspiration. Your clipboard is amazing, Amy! Your attention to detail is phenomenal. My favorite back-to-school memory is reconnecting with friends who I couldn't see over the summer. I really Love this project and I would like more information on how you made it!!!! So adorable! I love that you stamped a sentiment on each page!!! This little clipboard is adorable! I need something like this to keep handy at my crafting table to make notes on. Very cute! I love this Amy, it's so cool. I just love all the cool idea's that you have.